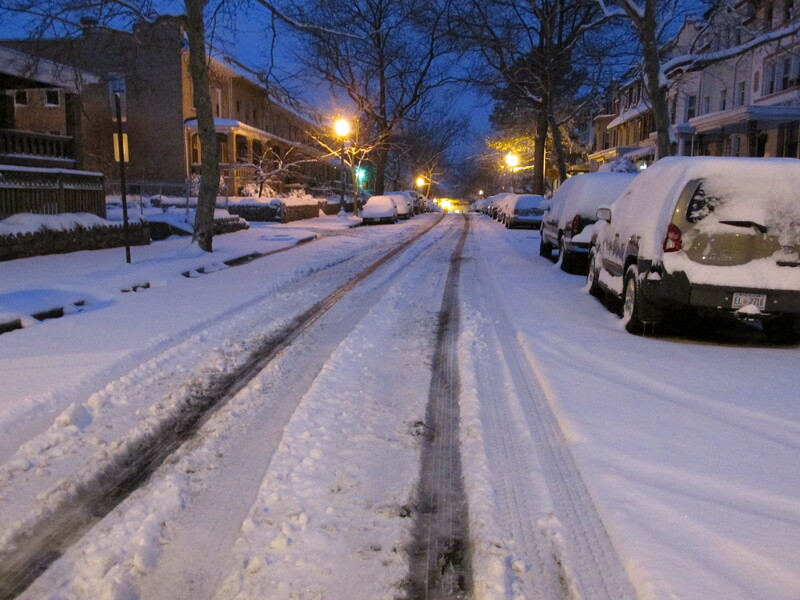 snow | Park View, D.C. 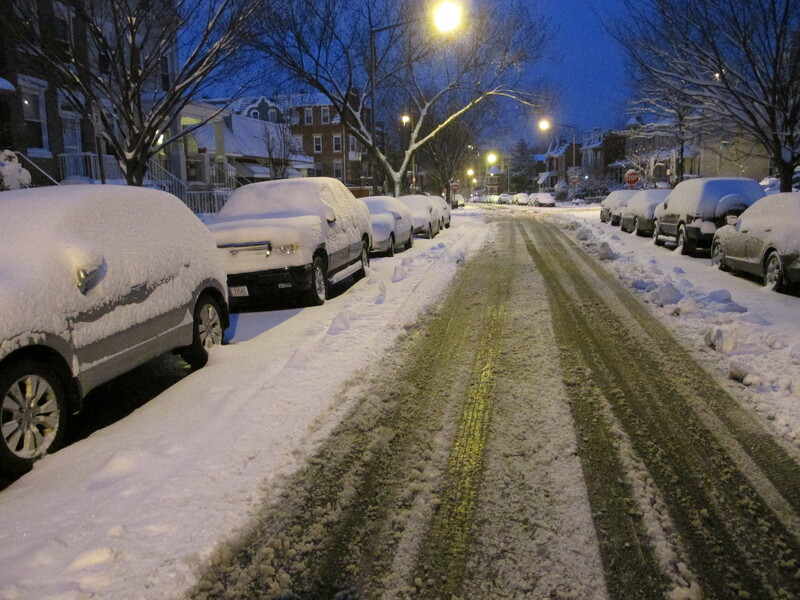 The Federal and District Governments are closed today due to the snow, as are DC Public Schools. This was also supposed to be the first day of early voting but I haven’t heard if it’s been delayed or not. The closures will not impact early voting. The Board of Elections announced before 7 a.m. that early voting will begin at 10:00 a.m. today at the lone voting center at One Judiciary Square, 441 4th St. NW. When you shovel today, be aware that the snow is wet and heavy. 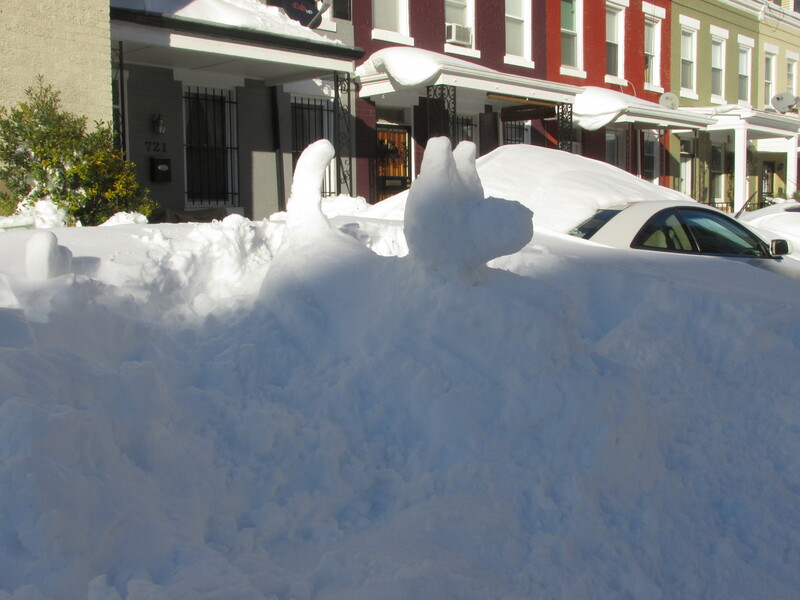 Take your time, consider shoveling smaller scoops, and if you have any neighbors who may needs assistance, lend a hand. Below are a few photos of Rock Creek Church Road and Quebec Place taken around 7 a.m. this morning. 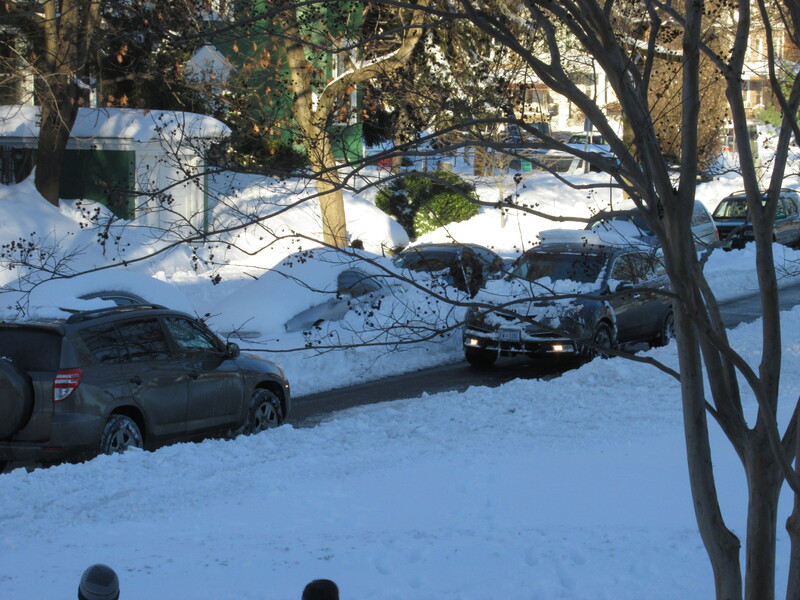 Story for the Day … Snow! With everything shut down today due to the snow, the only thing one can do is shovel the walkways, perhaps go out and play with the kids, and stay safe and warm inside. If you have any seniors or neighbors in need of assistance today, please consider lending a hand or checking in on them. 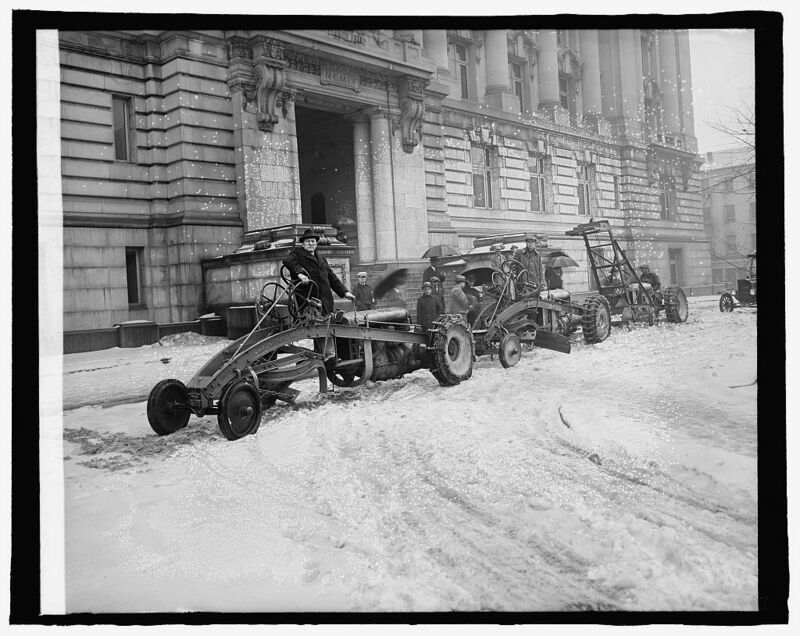 Below is a photo I found in the Library of Congress collection showing snow clean up in Washington, probably from the 1920s. 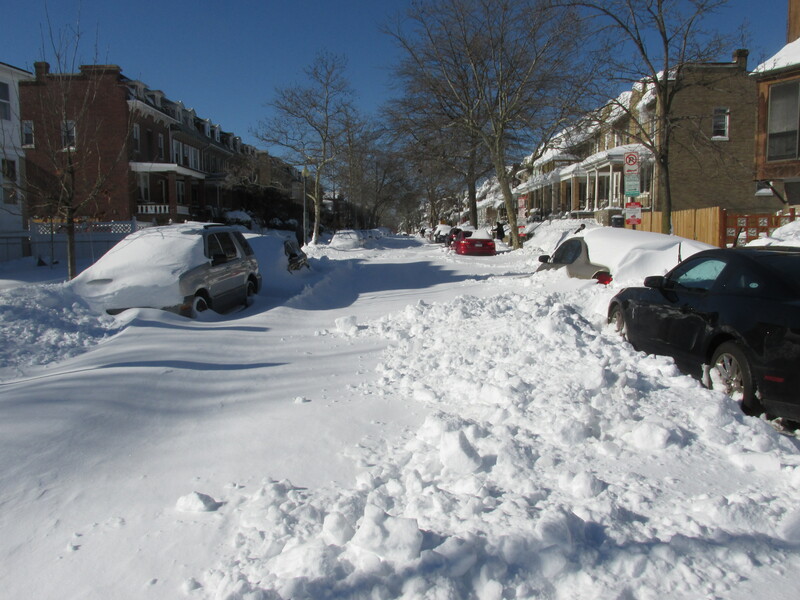 While the vehicles have changed and we now have plows on the roads, most of us still rely on shovels, muscles, and determination to clear our sidewalks. 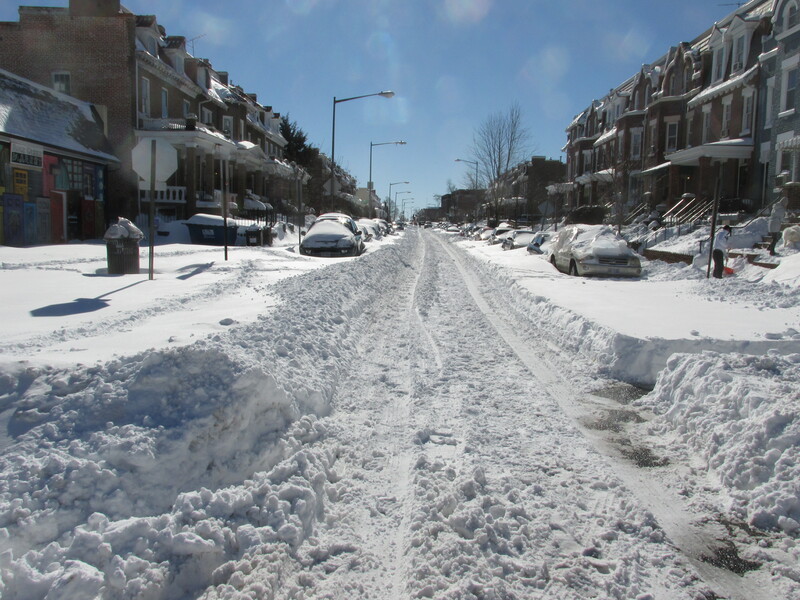 Tags: history and culture, snow, Snow shoveling, Washington D.C.
What’s the Best Way to Address Snow Removal at Public Spaces? 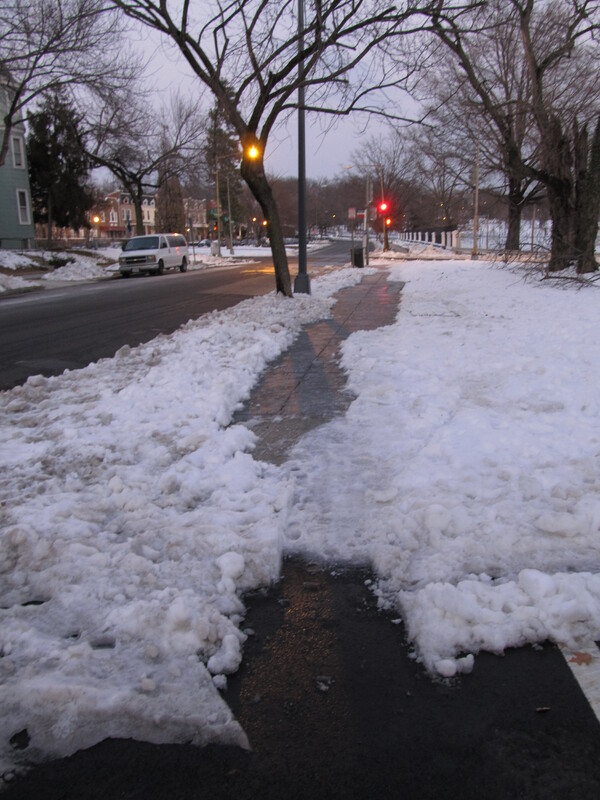 While I know the city doesn’t officially clear sidewalks and leaves it to residents to shovel the walks in front of their homes, there must be exceptions to this rule. 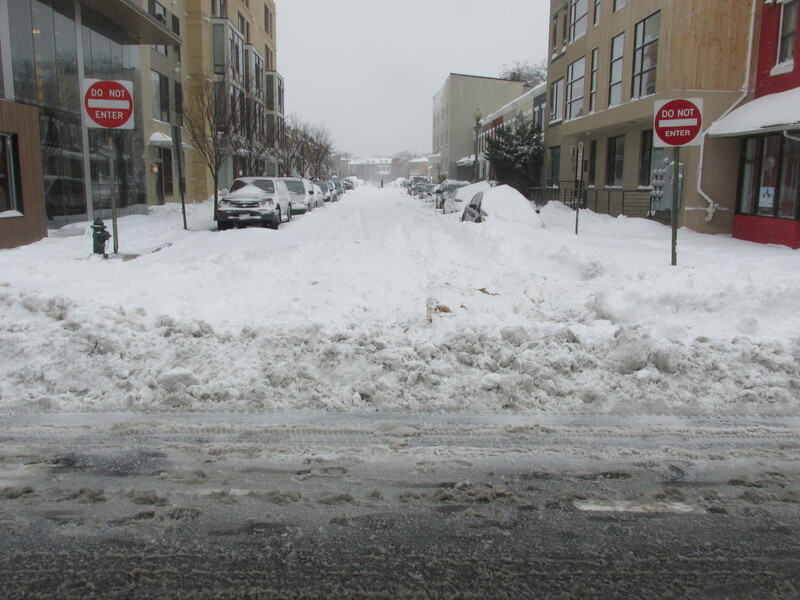 Not all property in the district is in front of a residence or business (and even those that are don’t all get shoveled). 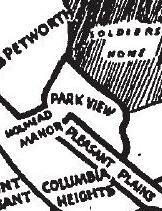 For instance, Reserve 321-A on the south side of Rock Creek Church Road just west of the old Soldiers’ Home is a small park. It has a Metro bus stop on the property, the District paid to put in new sidewalks this past summer, and the city also mows the grounds. 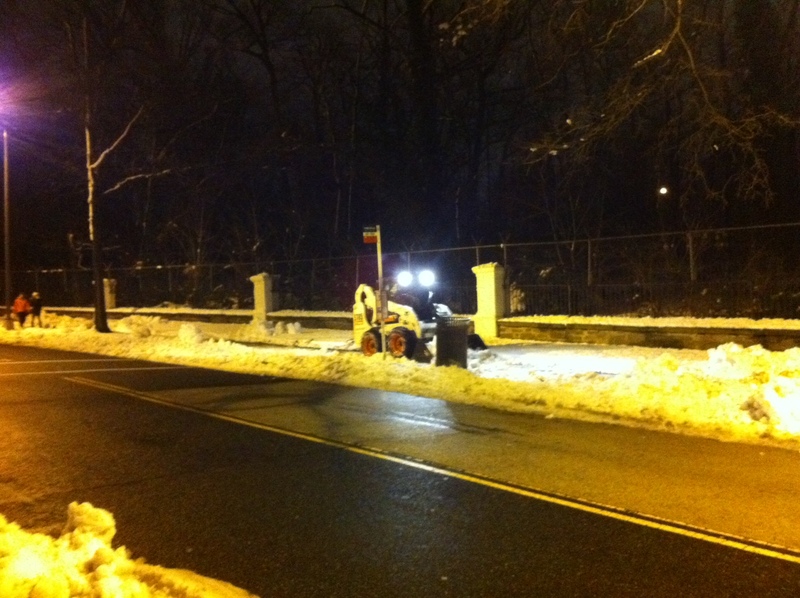 Is snow removal at this location something the city should take responsibility for, or is this something we residents should take ownership of? A similar situation exists along the south side of Rock Creek Church Road east of Park Place. Here, after the Ward 4 representatives from the Mayor’s Office of Community Relations and Services were contacted, crews cleaned the sidewalks along the Armed Forces Retirement Homes. I took a different approach with Reserve 321-A. Seeing that the temperature and sun had softened a lot of the snow on Sunday afternoon, I chose to shovel the sidewalk along Rock Creek Church Road. 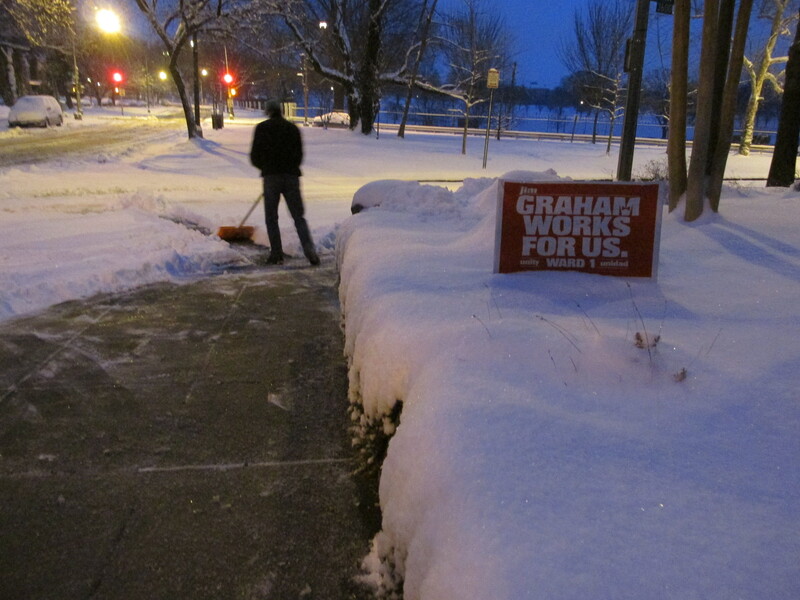 While I was fortunate to have some help, I didn’t have it in me to shovel the sidewalk along Park Place. While it would be nice if the city could take care of this property during snow events, my sense is that they have all they can handle just trying to keep the streets clear. 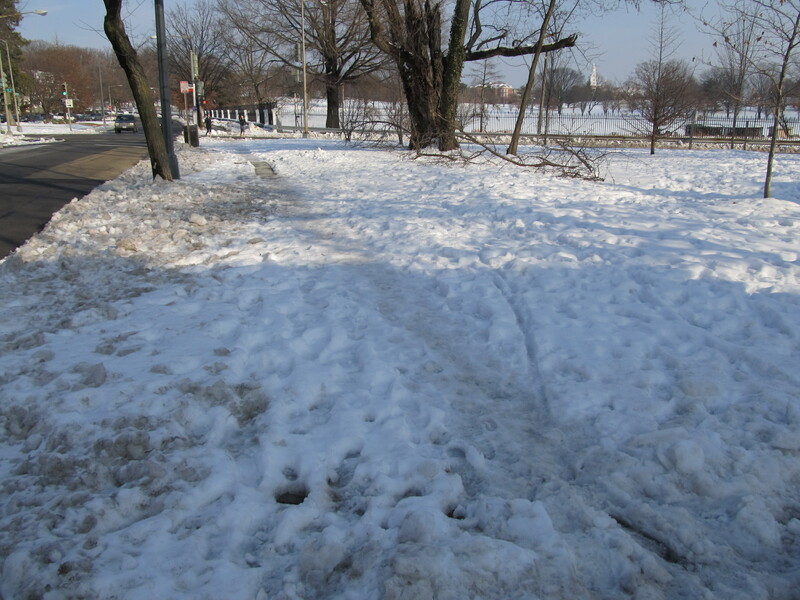 The most direct method I can think of would be if members of the community would be willing to adopt the park and share the responsibility of clearing the sidewalks. Living next door to this green space, I see children and a lot of dog walkers enjoy the benefits of the park … is anyone willing to help me keep the sidewalks clear? 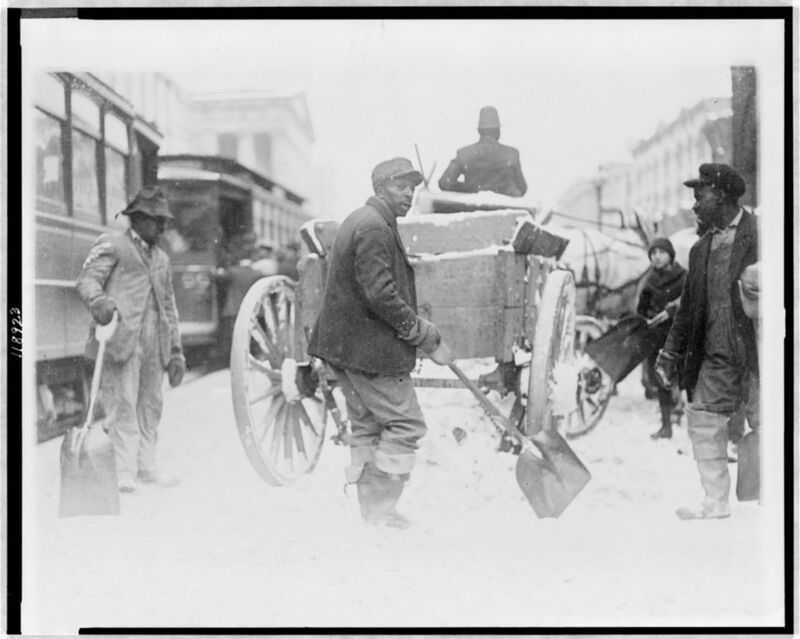 District snow plows, then and now. Left: Ford Motor Company snow plow equipment ca. 1925 in front of the District Building. (Photo courtesy of the Library of Congress collection). 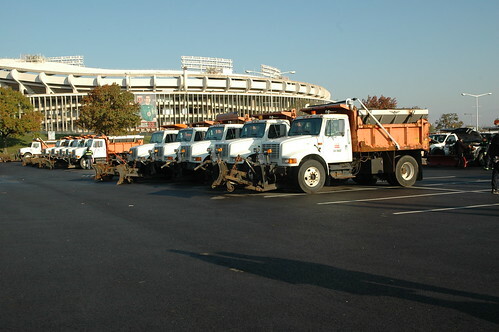 Right: DDOT snow plows in front of RFK stadium, November 5, 2010. 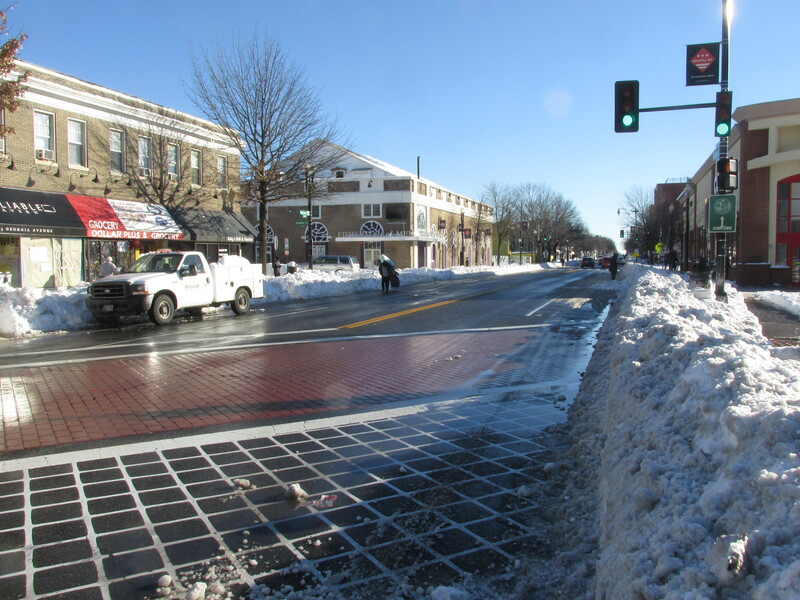 (Photo from the DDOTDC flickr pool). 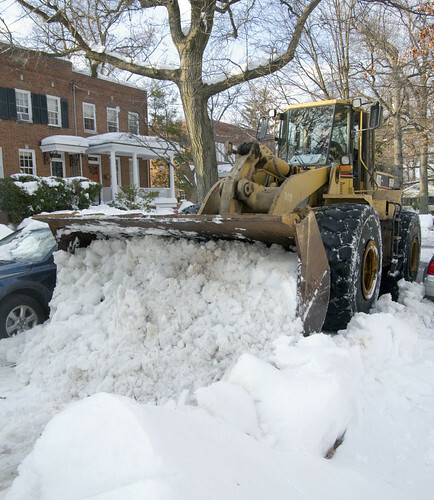 The image below is also from the DDOTDC flickr pool, and shows a Caterpillar Industrial Loader used in snow removal efforts from February 9, 2010. 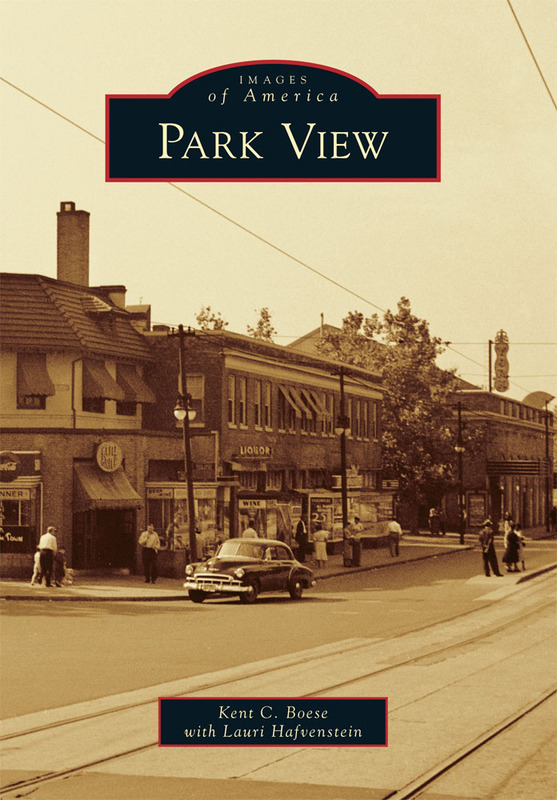 Is it Time for a Neighborhood Clean Up? 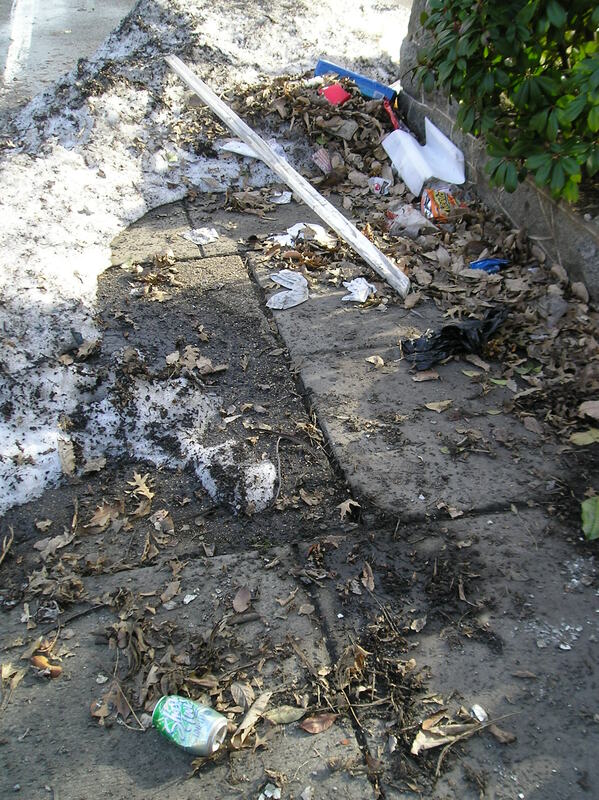 While its nice to see that most of the snow is finally gone, one thing that isn’t nice is all the trash that is left behind. When the plows and scoops got the snow out of the streets, they apparently also scooped up all the trash and left it in the snow piles as well. Now that it’s getting warm enough, is it time to organize a community clean up to get things nice and tidy again? Does anyone have any ideas on where the biggest trouble spots are? Additionally, has anyone organized one before? I know we can all pick up the trash in front of our homes without making a day of it, but it just strikes me that it would be more enjoyable if this were a community event and I know there are some areas that aren’t any particular person’s responsibility.